I saw this recipe in a Martha Stewart Living holiday issue ages ago…probably around 2000 or 2001, and I’ve been making them every single year since. I think this is the best shortbread recipe I’ve ever had, probably because of the addition of almonds, which I love. 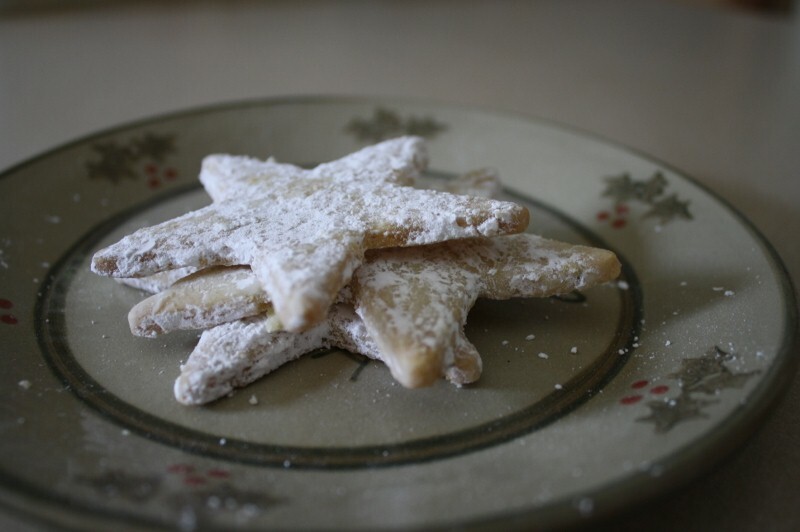 Plus, shortbread is my mom’s favorite cookie, and she loves almond, too, so even if I didn’t want to make these it wouldn’t matter because she requests them every year. She just asked me tonight if I was planning on making “those shortbread stars,” while looking at me with eyes that said “you’re making those shortbread stars,” and it made me realize I should probably write a post about them with enough time for people to make them for themselves. Trust me, your family will thank you. Luckily, I happened to have photographed a plate of them last year! I usually make a double recipe because they tend to disappear fast. And of course, you don’t have to make stars…you can make any shape you want! Whisk together flour and salt in bowl. Whisk together sugar and almonds in another bowl. Beat butter in stand mixer with paddle attachment until light and fluffy. Add sugar/almond combo and beat until combined. Add almond extract and beat again. Add flour mixture and mix until incorporated. Separate into 2 disks, wrap in plastic and refrigerate for at least one hour. Roll out into 1/4″ thickness. Cut out cookie shapes and place them on parchment lined cookie sheet. Bake 15-20 minutes, until golden. Carefully remove cookies to cooling rack. When still warm, toss in powdered sugar. Toss again when cooled. I love these cookies too and have made them for years. My problem is they are very delicate and fall apart easily. I like to give as gifts but they break apart too easily. Am I doing something wrong? Her recipe calls for sugar OR powdered sugar and I have been using powdered sugar. I sprinkle sugar over because they fall apart if I try to “toss” them. Would love some help here. Thanks. « Thanksgiving – Cranberries Rule!